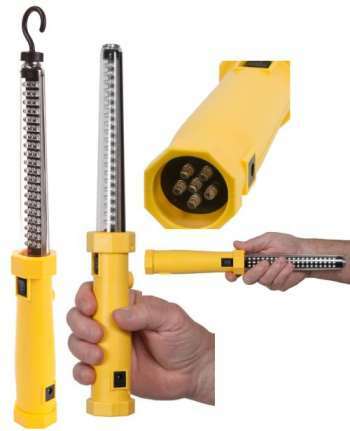 Nightstick 2-in-1 LED Work Light w/Spot Light - LED - RechargeableThis rechargeable all LED Work Light has both a spotlight and a floodlight built in. The spotlight, located in the base of the handle, is rated at 12 Lumens. It's perfect for putting a narrow beam of light into a specific area. The floodlight, rated at 120 Lumens, is designed for lighting up a large area. The idea is simple, use the spotlight to find the problem, and the floodlight to light up the area when fixing the problem. The work light has two magnets built in...one at the balance point in the middle of the handle, and the other at the tip of the light. The flat-bottom design of the handle means the light will stand up on most flat surfaces, and the octagonal shape to the handle keeps the floodlight aimed in the correct direction when you lay the light on its side. Further adding to the work light's hands-free features is the detachable magnetic hook. It can be attached to either integrated body magnet and rotated 360 degrees. The integrated Nickel Metal Hydride battery can be recharged with the included AC or DC power supply.